Deal, NJ - Upon further investigation of an earlier report posted by VIN News claiming that Rabbi Issac Dweck has renounced his son Solomon Dweck, VIN has verified that it’s not true. This rumor started a few days ago in Israel by a few irresponsible Hebrew-language news sites, and was for the first time reported today in English by a credible New Jersey news site. We contacted the New Jersey reporter, who claimed that his story was accurate and came from a reliable source. Based on this claim, VIN posted the story. VIN News has now been able to confirm directly from Rabbi Dweck and family what transpired this past Shabbos. Rabbi Dweck delivered a very emotional sermon in which he strongly denounced the phenomenon of a Jew informing on other Jews, said that he is also a victim in this saga together with Klal Yisroel, and asked for prayers from the entire Jewish community for his terrible suffering. Rabbi Dweck did not renounce his son, nor is he sitting shivah according to halachah. VIN regrets the error. We unconditionally apologize for any anguish the erroneous report may have caused to the Dweck family. We hope to continue to provide accurate reportage with Hashem’s help. Ok - Now Im confused - what does he have to say about all this? can he possibly justify"? Hopefully, the real truth will now come out that the rav did not denounce his son but rather gave legitimate musar to the olam that the midos of klal yisroel need to change. While I'm sure he does not approve of his son's actions, the willingness of so many yiddin within his community to break the law for a few dollars shows greed is alive and well. Leave the man alone. He is not trying to justify, he just is not sitting shiva. I do not call this working for the govt. Im sure he had a choice. Secondly, an insane person is not capable of doing what he did. Whatever the halacha is, what he did is digraceful. Well said. Also does the phrase from the gemorah ”Hakol bide shamayim chutz yirat shamayim” apply in this case? why do people feel a need to be ringside pundits on the minutia of his existence. of what possible significance or benefit could his sitting (or for that matter standing) be to anyone. PS this was written "tongue in cheek", so pls laugh and accept it in the manner in which it was intended and don't denounce me as an a"h, "shoite", imbecile etc. what about the story of R' Shimon Bar Yochai's son, who caught jewish robbers for the romans and sent them to their deaths? The Gemara in Bava Metzia (7th perek), seems to conclude that it was right to remove the thorns from G-d's Roses. Why is this clearly moser, the law of the government is more just than the roman law to kill thieves! can we speak rationally instead of just jumping to conclusions and killing the messenger? In my humble opinion the problem here is that the people who are complaining loudly that Dweck is "moser" don't really care about the fact that he may have committed the avayrah of "moser". If they cared about that avayrah, they would also care about the chillul hashem that the targets of the "moser" have caused and the aveyros they committed. What is really going on here is simply this: people don't like snitches. It just sounds better (and holier) to use the lashon hakodesh word "moser" rather than "snitch". The problem is that by focusing their wrath on the snitcher rather than on the snitchee(s) they are in essence acting no different than those who live in the inner city and are criticized for refusing to testify against drive-by shooters. So why don't those of you who keep calling Dweck a "moser" stop pretending that you are angry because you think he did an avayrah and just admit that you don't like "snitches." You'll feel better. The son might be Chayov Missoh, but he is not dead yet. He did not CH"V marry out of his faith either. No Shiva here then. (Just a few yidden will spent some 20 years each among murderers thanks to this Tachshit). you think he likes what's going on? Just know that your son is DREK, whether you sit shiva or not is irrelevant. Why do you call him a Rabbi? I can understand a journalist getting a few words wrong or even incorrectly citing a quotation but this whole story seems to have been fabricated to make his son look like the evil rasha while exonerating all of those who agreed to engage in these crimes and making such a chilul hashem. how coud this happen in an age when even the slightest error in attribution will be quickly corrected on the internet. if you didnt change the report? if he'll hang himself. will he sit shiva then? why wouldn't the father sit shivah? don't his son's action prompt him to cut off ties with him? would his father ever look at him again? i am sure that not; so why not practice AVAILOS? u are not being dan l'kaf zechut!! u have NO idea what happened, and u do not know these ppl. but hashem does, and hashem knows u too! u will be judged in 53 days. pls be more careful. hashem should be merachem on all those accused, and on u as well! kol tuv. Rabbi Dwek is an honorable man, it is terrible that he has to have his name dragged through all this mud. I also think that his son, although I've never met him, was known as a generous baal tzedakah, and we don't know what his nisyonos were so I will not denounce him like everyone else. because he IS a rabbi, you awful person! be dan l'kaf zechut! u dont know the man and u dont know his position! this is a jewish website??!!!! on app im posting to defend my brothers against goyish sonim, but here against the jewish ones! you will be judged in 53 days, my friend. and that Judge acts only on facts. not on rumors. and not on the substanceless assumptions of a tiny human mind. you have NO IDEA what this poor man is going through. you should never be tested in this way! u should never see such embarrassment! he and his son are 2 DIFFERENT PEOPLE after all, are they not?! the rabbi is not sitting shiva as of right now, we dont know that he wont do it in the future, but then again its not our BUSINESS! its between him and hashem, stop being so INSENSITIVE!!!!!!!!!! may all your children go b'derech hatorah and be a source of nachas to klal yisroel, u should never know from such shame. thank you sherlock holmes! if only we were all as smart as you. the fact is, the rabbanim were entrapped by shlomo dwek. he tried to do it to rav david yosef too, but he didnt budge. he made them feel sorry for him. he took advantage of the rachmanut that these rabbis had as jews, something many of this site's posters are unfortunately lacking. i know those rabbis personally and they are NOT criminals. they work tirelessly for the good of the community. i've said it a million times and i'll say it again - WE DO NOT KNOW WHAT EXACTLY HAPPENED HERE. i advise you to pray that hashem will be a kinder judge to u than u have been to these rabbis! dwek, on the other hand, was in trouble. instead of doing his time like a mentsch for the INSANE acts he is known to have committed (keep in mind 3 years have passed since), as his business partner sat the past 3 years and has recently completed his sentence and began a fresh slate with his family and a new job, NO - mr. dwek instead decided to be a moser - a crime for which the chofetz chaim states there is NO kapara - unlike chillul hashem, for which death atones, a moser will continue to burn even after the fuel in gehenom runs out! the saintly kind chofetz chaim tells us this! there is a BIG difference here - WHERE is the yirat Shamayim?? where is hashem in his brain right now?? his was thinking ONLY about himself!!!! what a shameful creature, i pity him! and i feel sorry for the holy rabbis who trusted him. one of which is a very close friend of his fathers and knows him since he was a small child! another man entrapped, solomons close friend since he was a young boy! hashem yerachem on his poor neshama! he gave in to his taava for money. and boy did it pay off. let this serve as an example for anyone who finds himself loving money. this can turn into a disease. he is a very smart man,. a genius even as a child. and look where it got him. first stealing from his neighbors and friends, and now this. hashem yerachem. Moiser is worse, and especially the way he did it with entrapment and bait. this piece if dirt. Very nice story, no comparison to this piece of Dreck that went around "creating" criminals. Besides that he himself is a massive low life thief and criminal. And now go was your fingers with bleach for trying to compare the holy Reb Luser ben Rabi Shimon to a crook ganev and moser. Let's leave alone the Rav, its non of his fault, he's heartbroken and ashamed of what happened, and let's hope he gets over with it. The son the rosha moiser is a seperate story, he should get what he deserves. The family must be so humiliated. Who is this drek's wife? How many kids? How can they go to camp/school with everyone talking about their father? Poor kids. They need compassion and empathy, from those who can take the high road. If you care about his wife and kids, you would stop discussing this online. They are entitled to privacy, methinks. they arent in camp! they told everyone on wednesday, today is our last day, bye! we're going to the hotel tomorrow! fbi is hiding them. not sure if they will enter the witness protection program. rumor is that his wife is leaving him... we'll see i guess. HASHEM YERACHEM!!! Af huh Kibeil Yisurim Al atzmo Af al pi Sheomru huh uvnoi boalu naaroh hamerosa beyom hakipurim. Sorry learning a gemorah like you do, doesn't only border on kefira it is. BTw did you use Artscroll? what is farsholtene ? from what i understood i think i agreed with you, but for some reason your post really made me laugh. you are right - entrapment is sick!! Bringing th egemarra to further your sinath chinam and to judge the people as guilty based on what?FBI and this lowlife,shame on you.That is the real chillul hashem.If Rosenbaum is such a bad guy,organ seller and all,why do they have zero real cases on him.The FBI has been following him for awhile and all they have is one case where he alledgedly conspired to do the act.Where is your gemarra kup.You believe everything you hear and read and decide it is a chillul hashemAre you stooping to dwecks level? He should sit shiva his son is a moser and lost his cheluk to Olam Haba. Call him and tell him VIN readers think his son lost his Olam Haba and is considered dead so he should sit shiva. He called my first cousin on sunday.....& asked her to do something 4 him. She asked a gadol if she should do it & he said "YES,lest he might turn on u 2(close relative)he's testing ur loyalty,don't take a chance"
He couldnt be sitting shiva for his son, as he's not dead (yet). One only sits shiva for a dead relative, not a live one. The assumption that one sits shiva for a person that went off the derech is a mistake, although a very common one. If a Jew goes off the derech and then dies, his family sits shiva for that person because that person is still a jew, no matter what. VINN-thanks for clarifying and glad the father is not sitting shiva. although a terriable thing happened, shiva does not seem the appropriate response. His emotional speech should be enough to see where he stands. When I drove to the nursing home where I work this past Friday morning, I had a pit in my stomach in anticipation of the inevitable comments I was sure to receive from my coworkers. The comments came, and it was embarrassing; I didn’t have any good excuse or response to what they were asking about the hypocritical acts of the Rabbis in the Frum community. I was particular wary of a certain coworker, the Italian Catholic lady who is the administrator. She is also from West Long Branch, and all too familiar with the Deal community. At a quiet moment after a meeting, she pulled me aside, and genuinely expressed that she felt so bad for me and the Frum community as a whole. She understood that we have lofty standards, and have impeccable values, but that the massive Chillul Hash-m that transpired would make people view ALL Frum Yidden with scorn. Growing up she remembers how anytime an Italian Mafioso was caught doing something illegal, her mother would cringe and remark how everyone is going to say that all of the Italians are involved with the Mafia. She was convinced of the goodness of the Frum community due to her personal experiences with them. She said that when her husband was sick with his final illness, every night when she returned from the hospital, she found supper waiting for her (”in disposable tins, because they couldn’t leave their dishes with me”). When her husband ultimately succumbed to the illness, she said that her priests were of no help to her in trying to cope with her loss. She said comfort came from a local Rabbi’s wife, and then the Rabbi who called and left her a message offering his council whenever she needed it. She knows some people did things wrong, and who knows what pressure they were under to do what they did, but she concluded that the kindness showed to her, an Italian Catholic, by the Deal community convinced her long ago that the religious Jews are very good decent people. One story was not going to change that. Who was the couple that made the Kiddush Hash-m that left such lasting impression on her? Rabbi and Mrs. Dwek from Deal, Hash-m should give them strength. There will unfortunately always be individuals who will commit acts that can potentially drag down Frum Yidden as a whole. The more solidly we cement our reputation as honest upstanding individuals during everyday life, the more likely we will be to protect ourselves from such perceptions in the future. As a whole, we are in galus, and have to suffer through the time tested “Eisav soineh es Yaakov,” but as individuals, we can make tremendous Kiddush Hash-ms in our daily lives that earn us the respect and admiration of those around us. For Heaven's sake, some of you speak about shiva and death as if you have no families of your own!If you have children, keep quiet because you never ever know what will happen in the future. Have some compassion for this poor family that they have a son who put them through this anguish and pain.Stop playing the "holier than thou", self righteous and indignant person because you never know....and should never know. The words you speak remind me of the vicious anti-semites out there.Not one shred of mercy- what the heck is wrong with you people?!!!!! These people, families, Rebbis are in shock and turmoil including the Dweck family and they don't need disgusting talk to add more salt.They are all bleeding. His wife is standing by his side and does not want to divorce him. She is currently with him, as are their children. you are heartless. Give the Rabbi some privacy in his difficult time. Hopefully he has friends and family to turn to, and not VIN posters. Sorry, the Gemara concludes that R ' Yehoshua firmly protested his action. The Ramba"m rules like R' Yehoshua. In addition, the Gemoro concludes that all Rabonim of his time were angry at R' Elozor, and wouldn't even had buried him. And finally, R' Elozor was like a Policeman, not someone who caused people to stumble. 1] do you have to work lyfnim mshyras hodyn? It's too bad that she can't divorce him unless he agrees to it. i wish you all would realize that the rabbi is most certainly demonstrating double standards, regardless of all the sermons he gives, until the rabbi refuses to sit Shivah he is simply demonstrating to the rest of klal yisroel that it is totally acceptable to be an outright musar. its about time that he takes full responsibility in accordance with the Torah, otherwise he is simply no Jewish leader whatsoever. The system is not farsholtene, it is the people who abuse it that are farsholtene. The recipients of the dough knew that it came from illegal activity, and for you people from BP & Willi, that means "ill-gotten gains", which no honest person should ever touch. good point maybe we should not be harsh on hin now and try to convince him to testify in court that these rabbis did not wanna do anything illigal. Just a quick question: everyone says that Drek begged for rachmonus that he can't feed his family, how do you guys know that? The feds say that all in all they laundered around $3,000,000, which knowing the feds I am sure that its vastly exaggerated, but let's say it was $1,000,000, and even if its over the course 2 years, that is alot of money and not just money to feed his family. Disclaimer: I am not condoning what he did, he is a filthy snitch and should be dealt with accordingly, im just trying to understand. His wife pearl is in a predicament ,1) They have claims that they were wronged and it might be legit claims 2) His wife pearl claims that this whole fiasco would not have happened,she claims that this all started when his own uncle started a criminal complain in court against her husband solomon back in 2006 3) like in every case there is one side of the story,then there is the other side of the story,then there is the loshon hora side that is totally false, 4) unpredictable mistakes happened here , Decisions were made under pressure and in heat of the moment that should never have happened 5) so folks keep it cool do not Judge , what does it say in peruk. Al todin es chaivero at shetagia lemkomai" no one is happy with this outcome this story is not yet finished it will evolve and it might even go back in a different direction. “ what is farsholtene ? from what i understood i think i agreed with you, but for some reason your post really made me laugh. you are right - entrapment is sick!! they are practicing aveilos...i know for a fact - they are not eating meat, listening to music, doing laundry.on thurs he will sit on the ground & recite kinus. “ thank you sherlock holmes! if only we were all as smart as you. We've got a problem here. A goniff is a goniff and deena demalchuseh deena. Great post..your word's are well chosen. they are welcome to canada. sephardim here are very forgiving. what are your sources???? i dont believe they are in lakewood. im pretty sure they are with him, at least for the time being. 1. We only know what we read and hear. 3. We do not know what each of us would do in any of their shoes. 4. We should treat them as we would like to be treated if found in similar circumstances. 5. We should learn lessons and grow from this both individually and as a people. 6. We put people up on their pedestals. Let's not be so harsh to them when it's time to take them down; for it is within us all to test the limits of power. Absolute power currupts absolutely. May Hash-m bless us all with peace, wisdom, health, joy and unity. in that case r' shimon bar yohai was not also a robber catching other robbers in order to escape his own incarceration. that is, in your opinion. what you see as great, well-chosen words, someone else may see differently. like, say, as the over-confident ramblings of an over-thinking know-it-all with too much time on his hands. Solomon Dwek knew exactly what he was doing when he entrapped his victims at the behest of the FBI to save his own skin. He used self-pity and his fathers good name to convince people to "help" him feed his family and hide his ficticious ill-gotten gains, making the rabbis accomplices to his crimes as well. Whether or not the accused rabbis and others who were arrested have been at this forever or even once, it was wrong. BUT THERE IS NO WAY ON G-D'S GOOD EARTH THAT THAT P.O.S. SOLOMON SHOULD HAVE EVER SET THEM UP LIKE THAT!!!! I hope he's happy that the entire Jewish community (not just the Syrians) will come under investigation for every check every one of us wrote to a charity, legit or not. He should hang himself on Norwood Avenue!!! I'll even provide the giant inflatible rat for the festivities. I think these ppl r good ppl that r struggling to make ends meet. except of course for the kidney guy hes a little sick..... never judge another person who needs bread on his table. I agree! I'm glad there still are some people with their heads screwed on straight. he did not renounce his son, but he couldn't say his name either. he referred to him as "the other fellow" and stated that any negative things anyone has to say he's accepting, anything negative about himself he accepts this decree of humiliation from hashem, and anything anyone has to say about "the other fellow" he accepts and he says 100 times worse. he said that "what happened" (i.e.. what shlomo did) was disgusting, despicable, and absolutely UNFORGIVABLE. he stated that as every year we all get up motza'ei tisha b'av and look forward to a happy future, this is a tisha b'av he does not think he will be able to get up from. he also said he will with Hashem's help he plans on addressing the community again in the future. "If...one is guilty of a crime, and according to the law of the land deserves a prison sentence, or will be put to death, even though according to Jewish law his punishment would not be as severe, this is not mesirah (see Ritva to Bava Metsia 83b; Dvar Avraham vol. I pg. 8). One would still not be allowed to hand this individual over to the civil authorities because this is the equivalent of returning aveidas akum, which is usually not allowed. In an instance of avoiding a chilul Hashem, just like we would be obligated to return the aveidas akum, so too we would be obligated to hand over this individual (see Rama, Choshen Mishpat 388:12)." so many, what percentage of the Sephardic Community is that ?...how many Sephardic jews broke the law in this case, that you cosciously can say so many ?? also please keep in mind " Innocent till proven guilty ??" I dont understand how can man be convinced for acts he didnt commit? After all check and all was only a fake! 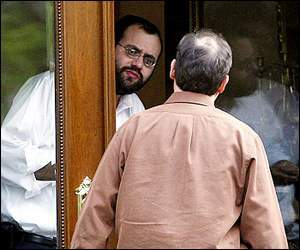 i know rabbi dweck and he is not evil like his son so dont go accusing him for the shame that his son has caused us!!!! People may not like snitches as you say, but in this case the moser is completely prejudice because it specifically states a jew not snitching on a jew to a non-jew. How frightening for a population as us that suffered at the hands of discrimination to foster such thinking. If someone is committing a crime (jew or non-jew) I think god says it is wrong. If I know it is wrong and I am asked about it, should I become a liar?